Low-cost Office. 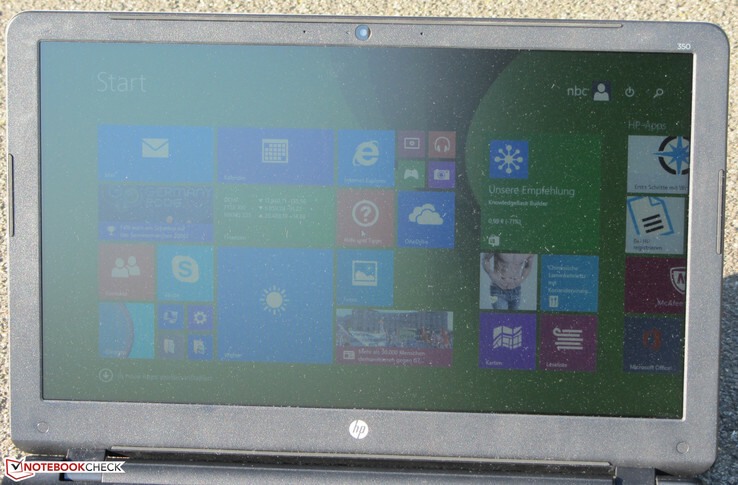 With the 350 G1, HP offers a simple Office notebook with Haswell Pentium. You only need to put 290 Euros (~$320) on the table to own this 15.6-inch model. The notebooks from HP's 35X series appeal to both private and office users. Within this series, HP offers the budget-priced 15.6-inch office machine, which can be equipped with AMD as well as Intel components. Notebooks with dedicated graphics cards are also available. We have already tested the 350 G1 and the 355 G2 models of this series. Now we take a look at the entry-level variant, so to speak, of the 350-series. Our test report reveals whether this machine is worth it. The HP 35X-series does not lack competitors. These include, for example, the Acer Extensa 2510, the Lenovo G50, the Acer Aspire E5-521, and the Toshiba Satellite L50D-B. Since the 35X models that we have already tested have the same build, we will not go into further detail in terms of the case, connectivity, input devices, or speakers. This information can be found in our review of the HP 350 G1 J4U34EA. Our test device is equipped with a matte 15.6-inch display, which works with a native resolution of 1366x768 pixels. The monitor's brightness (234.4 cd/m²) and contrast (333:1) are not overwhelming, but acceptable at this price range. In factory condition, the monitor has an average DeltaE deviation of 13.31 - a normal value for a notebook in the lower price range. The goal is a value lower than 3. Moreover, the monitor suffers from a noticeable blue tinge. The HP 350 G1 is equipped with a TN panel that is unstable when viewed at an angle. Typically, you cannot expect anything else in this price range. The monitor cannot be read from all positions. However, the notebook can still be used outside. 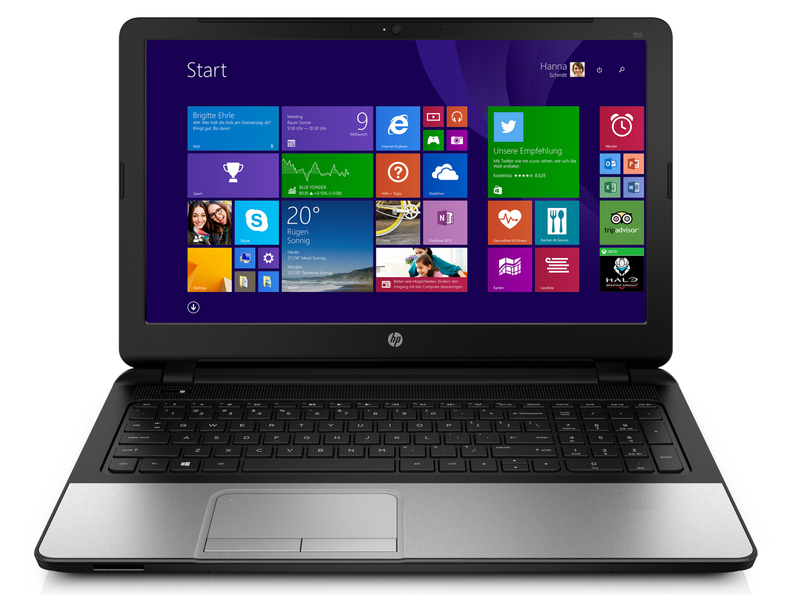 The HP 350 G1 offers an affordable office notebook in 15.6-inch format. It offers enough processing power for office and internet related applications. Our test model can be purchased for about 290 Euros (~$320). HP also offers a number of other differently equipped variants in its product line. Unlike other low-priced notebooks equipped with Intel processors, there is no low-performance Bay Trail processor in this HP machine; instead, it has a Haswell processor, the Pentium 3558U. The CPU runs at a speed of 1.7 GHz. There is no Turbo. Technically, it is similar to the Core i3-4010U processor. However, the Pentium is missing the Core i3's Hyperthreading function and therefore lags noticeably behind the Core i3 CPU. The Pentium outperforms the dual-core Bay Trail processors quite easily. Quad-core Bay Trail CPUs can at least keep up thanks to Multithread performance. With the Pentium 3556U processor, we have already tested an identical sister model of the Pentium 3558U processor. There is a small but important difference between them: Only the 3558U processor supports Intel's Quick-Sync function, which allows for a hardware-accelerated conversion of video data. The System works well and smoothly. There were no problems. The results in the PCMark Benchmarks come out well. Here the HP Notebook sits at the same level as Haswell Core i3 notebooks. This is not a surprise, since Pentium and the Core i3 processors add nothing extra for single thread performance, which is more important for daily use. An increase in system performance of the HP 350 G1 is possible: Graphics performance can be improved with the addition of a second RAM module. The storage would then work in dual-channel mode, through which the GPU would be better exploited. One further measure would be swapping the hard drive for a solid-state disk. Both can be achieved quickly and easily, since the notebook is equipped with a maintenance hatch. Data storage is provided by a hard drive from Toshiba. This has a capacity of 500 GB and runs at 5400 revolutions per minute. The drive's transfer rates are at a normal level for a 5400 module. The Core i5 sister model of the HP 350 G1 that we have already tested, is equipped with an additional mSATA slot. Our current test machine does not have this extra slot. Intel's HD Graphics GPU is responsible for the graphics. It supports DirectX 11.1 and runs at speeds between 200 MHz and 1000 MHz. The results in the 3DMark Benchmarks are at a normal level for this graphics core. A comparable graphics core from AMD, like the R4 (Beema) GPU, has more performance at its disposal. As previously stated, the graphics performance of the HP 350 can be further improved with the addition of a second RAM module (= dual-channel mode active). In this case, the results of the 3DMark 2011 for our test machine improves to 624 points, reflecting an improvement of just about 9%. 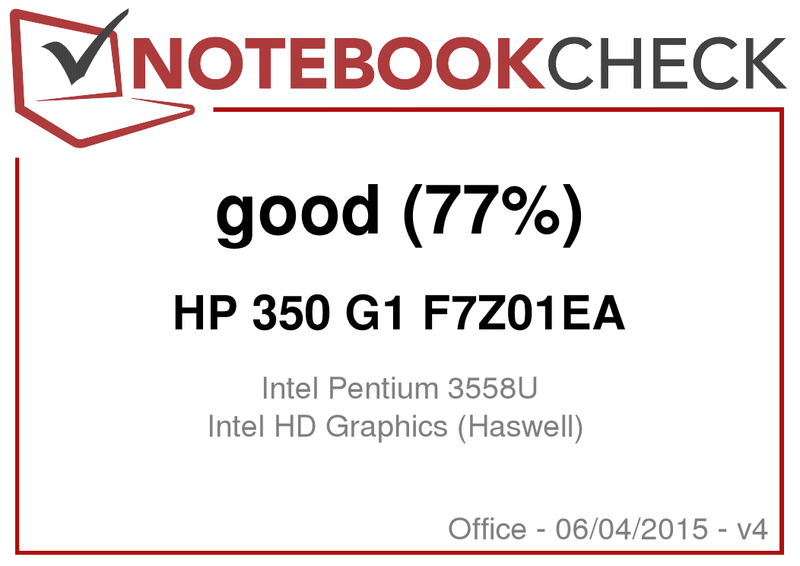 Clearly, the HP 350 G1 is not a notebook for gamers. However, a few games can be played at low resolution and quality settings. A few more frames can be squeezed out of the hardware with the addition of a second RAM module (dual-channel mode active). However, for top-of-the-line games like “The Witcher 3” or “Battlefield Hardline”, it is not enough by a long shot. The HP machine's noise production stays within limits throughout the entire load range. While idling, the fan runs permanently at low speed. This can be turned off, though; the function "Fan always on" must be deactivated in the notebook's BIOS. Then the fan often stays silent. Under load, the fan spins up. During our stress test, we measured a decibel level of 38.9 dB - a good result. The HP 350 G1 during stress test. The HP 350 G1 made it through our stress test (Prime95 and FurMark run for at least an hour) in similar fashion on both mains and battery power. The processor ran for approximately ten minutes at full speed. Then it throttled back to 1.2 to 1.3 GHz. The graphics core ran at 800 to 900 MHz. The HP notebook's case warmed up by a very small amount. 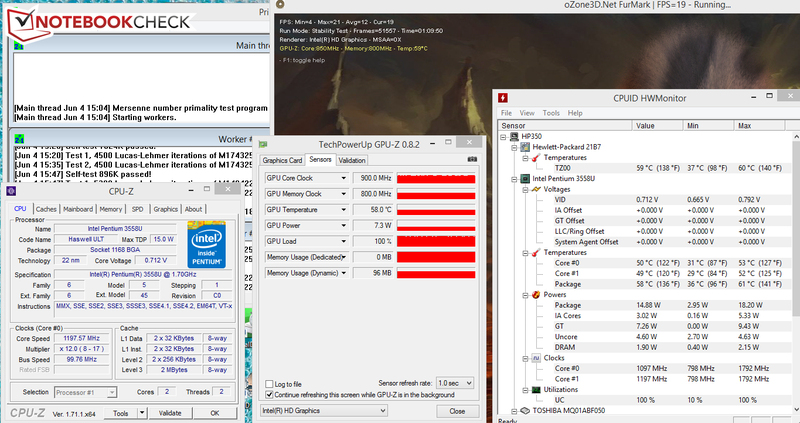 During the stress test, the temperatures at all points lay well below 40 °C (104 °F). (+) In idle usage, the average temperature for the upper side is 22.7 °C / 73 F, compared to the device average of 29.4 °C / 85 F.
While idling, the machine's power consumption was below 10 watts - a normal level for Haswell notebooks. During the stress test, the power consumption rose to 27.8 watts. After about 10 minutes, the value decreased, since the CPU was slowed down. In our practical WLAN test, web sites are loaded automatically in 40-second intervals. The "balanced" profile is active, and display brightness is set at about 150 cd/m². The HP 350 G1 managed a run time of 4:50 hours, placing it on par with both sister models. 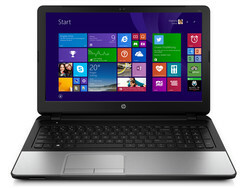 The HP 350 G1 presents an office notebook in 15.6-inch format at a price just under 300 Euros (~$340). The built-in processor offers enough processing power for office and internet applications, and leaves Intel's Bay Trail processors and AMD's Beema APUs behind in single thread performance as it is relevant in practice. At the same time, the machine generally works quietly and hardly warms up at all. Add to these the good input devices. Positive: The 350 G1 belongs to the slowly dying genre of notebooks with maintenance hatches. This allows quick access to the HP machine's RAM and hard drive. Brightness and contrast of the matte monitor are not very impressive - which is not to be expected at this price range anyway. The monitor is quite acceptable. In conclusion, we can say: Users looking for a reasonably priced office machine cannot go wrong with the HP 350 G1.